King David (ca. 1030-990 B.C.) - After the Lord rejected Saul for being disobedient, a second king was anointed by the prophet Samuel. His name was David, and he would be remembered as Israel's greatest king. The "man after God's own heart", as the Bible says, ruled for 40 years and his life was marked by many tumultuous events. 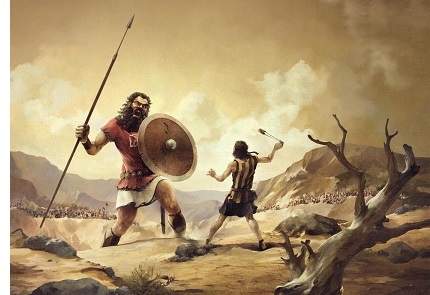 As a young man, before he was king, he famously slew the giant, Goliath. However, it had the negative effect of turning Israel's reigning king, Saul, against him. David's fame had surpassed his own and the king sought to kill him for it. This appears to have resulted in a civil war at the same time Israel was fighting against the Philistines. However, in deference to the king, David refused to kill Saul when he had the opportunity. Instead, Saul died in battle with the Philistines, having killed himself after being injured. This did not end the civil war though. There was a struggle over succession. Saul's son. Ish-Bosheth, claimed the throne of Israel and managed to hold it for two years. Meanwhile, the house of Judah, one of the twelve tribes of Israel of which David belonged, anointed him as their king. The war lasted for several years, but swung in David's favor when a key ally of Ish-Bosheth, named Abner, switched allegiances. Ish-Bosheth was killed and support for the house of Saul quickly crumbled. David became king over all Israel. He ruled for several years successfully, defeating many of Israel's enemies and expanding his kingdom. As mentioned previously, he captured and made Jerusalem his capital. And then came the second famous event of his life. His adulterous relationship with Bathsheba. After she became pregnant, David had her husband, Uriah, murdered by intentionally placing him on the front line in a battle against the Ammonites where the fighting was "fiercest", and then pulling back the troops so that Uriah would be struck down. The story is recorded in the book of II Samuel, chapter 11 of the Old Testament. Needless to say, God was not pleased with David. He allowed him to remain king, but caused his house to descend into chaos, leading to civil war within his own family. Bathsheba's unborn child died, but she and David married and they had another son, whose name was Solomon.